Winters are almost here and some of you must be planning a winter trip to Ladakh, hoping to experience bone chilling temperatures, snow covered mountains and walk on the frozen Pangong Tso. This winter trip plan and itinerary for Ladakh is perfect for those who aren’t planning to visit Ladakh for trekking, rather to enjoy and photograph this heavenly abode in Himalayas. Day 1, Leh: Arrive in Leh; rest till noon or till lunch (depending on how you feel). If you aren’t feeling any effects of AMS (headache, breathlessness, nausea etc. ), then visit Shanti Stupa and Leh Palace. Reach Leh Main Market by evening, have a light stroll of the market (should help you acclimatize) and have dinner at Neha Sweets. Day 2, Sham Valley: Apply for Inner Line Permit (PAP if you are a foreigner) for Nubra Valley, Pangong Tso and Tso Moriri. 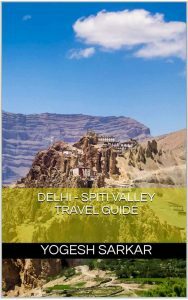 Then visit Hall of Fame, Magnetic Hill, Gurudwara Pathar Sahib, Indus and Zanskar Confluence, Alchi, Likir and Basgo Monasteries. Stop at Nimmu for samosa and chole-bhature (not great, but decent). Dinner at Neha Sweets or at the hotel you are staying at. 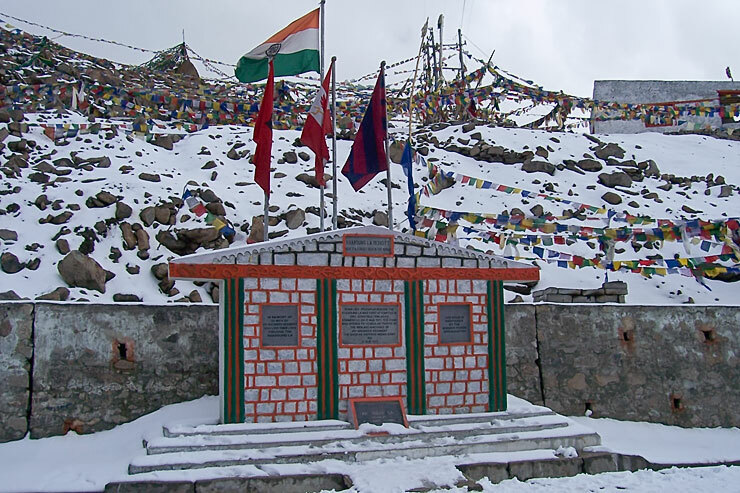 Day 3, Khardung La and Nubra Valley: Travel on the Highest Motorable Road in the World, Khardung La. 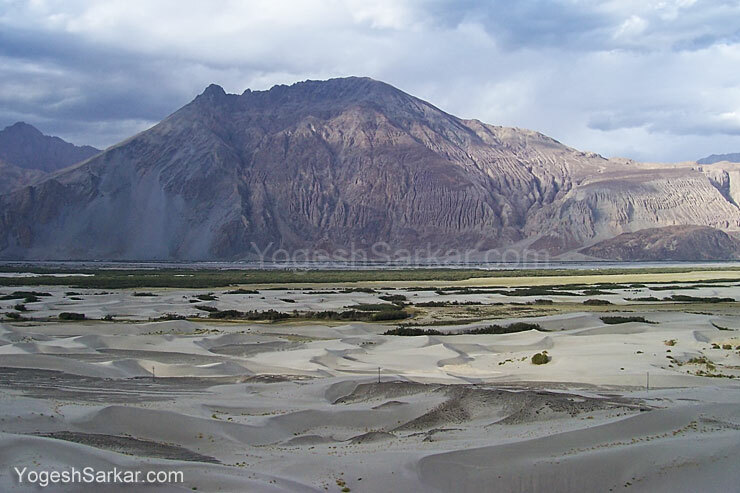 After having your customary photo taken at the pass, quickly descend to Nubra Valley, in order to avoid spending too much time at high altitude. Stay at Diskit or Hunder Village, and post lunch, visit Diskit Monastery. Day 5, Pangong Tso: Even though Khardung La is the highest motorable road, Chang La is steeper. So after a nerve wrecking ascend to Chang La and descend to Durbuk, head to Pangong Tso for beautiful views of this serene lake. 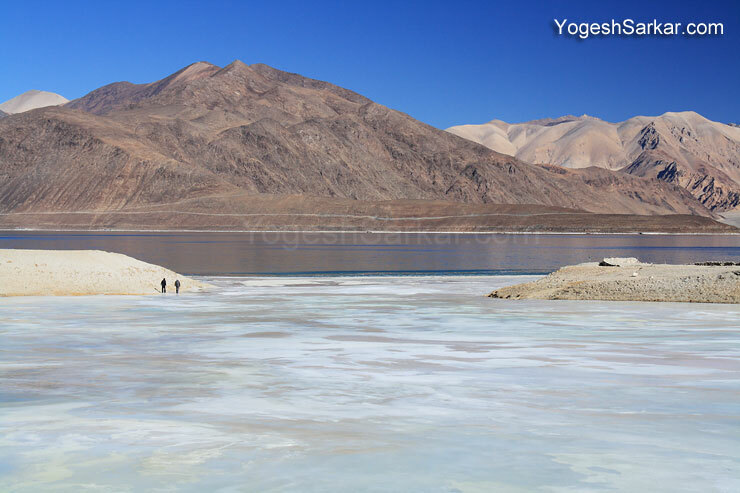 If you are traveling between middle of January and end of February, you will see completely frozen Pangong Tso, on which you can even drive your own car. 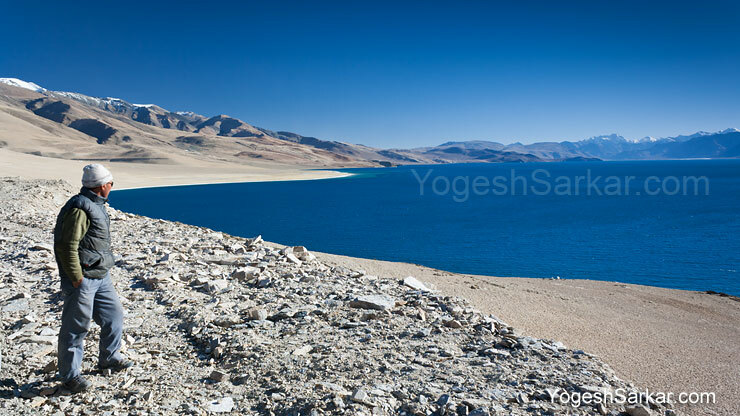 If you are visiting earlier than that, you will see Pangong Tso in various hues of blue, either way, you won’t be disappointed. Around evening, head back to Tangste for night stay. Make sure to have your breakfast at the second last dhaba in Karu, it has delicious parathas. Day 6, Harong Wet Lands and Chumathang: Visit Harong Wet Lands and then head to Chumathang Village for night stay. En route have your lunch at Karu and then dinner at Chumathang. Night at Chumathang would likely be your comfiest night in Ladakh (if you aren’t staying in a centrally heated hotel in Leh), thanks to the hot springs under the Hot Spring Resort. Day 7, Tso Moriri: Visit Tso Moriri Lake, then head back to Leh. Have your breakfast and lunch at Chumathang, since Korzok Village will have few if any amenities available at that time. Day 8, Monastery Circuit: Visit Hemis, Shey, Thiksey and Spituk Monasteries. 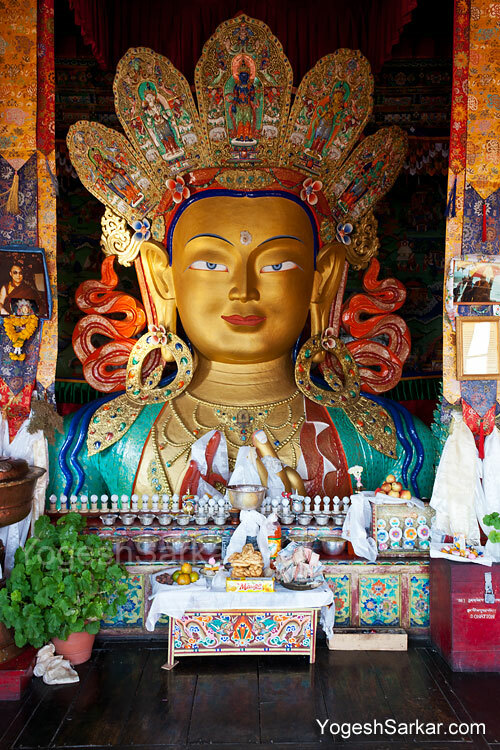 Also visit Shanti Stupa, Leh Palace, Namgyal Tsemo Gompa and Hall of Fame, if you weren’t able to visit these earlier. Do a bit of shopping (there is a cooperative store behind the Main Market, little ahead of taxi stand), have your dinner at Neha Sweets and enjoy your last night in Ladakh. Above itinerary is perfect for those, who work 5 days a week and can afford to take 5 day leave from work. If all you can manage is 7 days, then you will have to skip Nubra Valley or Tso Moriri and do Pangong Tso as a day trip. If you have a lot more days, then well, lucky you, Ladakh have a lot more places to offer to travelers and you can leave a comment below, stating the number of days you have in hand and I will design a free personalized itinerary for you. Tips: Make sure to drink plenty of water and eat good wholesome food to keep your energy up and avoid dehydration. Avoid taking off gloves while outside and make sure to avoid going out, when your hairs are wet. Also make sure you do not overexert yourself, since Acute Mountain Sickness can be a real killer. 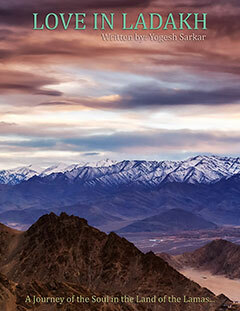 Check out my Ladakh Winter Travel FAQ for more information on traveling to Ladakh in winter. Shashindra, Zanskar Valley is only accessible through Chadar Trek. Road connectivity to Zanskar Valley is completely disrupted in winters and it only resumes by end of April or May. Varun, during winter, Manali – Leh Highway as well as Srinagar – Leh Highway get shut due to snowfall and reopen around May. 2. If yes, are bikes available easily. Riding motorcycles at that time would be a herculean task, with temperatures falling as low as -25 degree Celsius. While locals still manage to ride motorcycles, they are locals and accustomed to not only riding in such cold conditions, but also on snow and ice. So at least I wouldn’t recommend doing it, unless you can find completely airproof riding gear. Bus service might be operational at that time, but it isn’t really a good option, since buses aren’t regular http://www.bcmtouring.com/forum/buses-taxis-india-f38/2013-time-table-bus-services-leh-ladakh-t53859/. Taxis charge normal listed rates and you can get 10-15% discount over it, since business is slow at that time and there are only handful of travelers around.Here is the link to taxi rate list http://www.bcmtouring.com/forum/buses-taxis-india-f38/leh-taxi-rate-list-2013-14-a-t52095/. You do not need to book hotel at Leh, you can easily get it after arriving there. Finding accommodation at Tangste shouldn’t be an issue either, though guest houses at Spangmik etc. close down in winter and home stays aren’t recommended, since it is unlikely they have any gas heaters. thanks a lot sir for hepling us to make our trips memorable. Thank you Nirmal. You can follow the above plan for day 1 on 27th and day 2 on 28th. 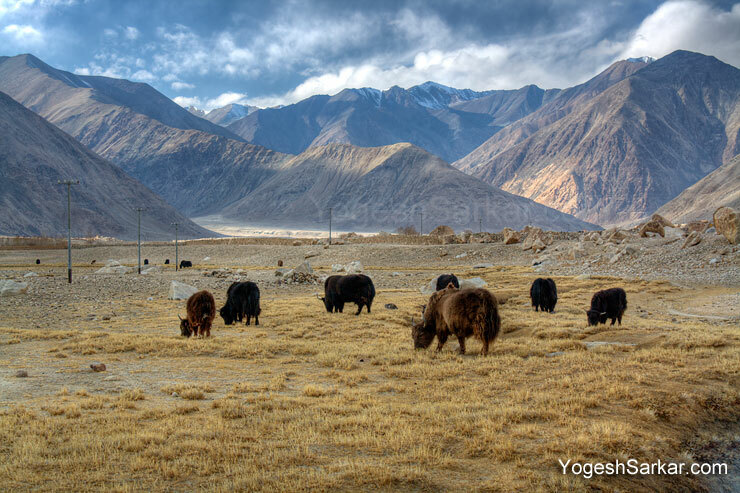 On 29th, you can either do a day trip to Nubra Valley or Pangong Tso. Alternatively you can head to Kargil on 28th and come back to Leh on 29th. Going to Pangong Tso would be risker, since it is at a higher altitude (might cause AMS) and Chang La can be rougher than Khardung La. On 6th Feb, it would be a good idea to follow day 8 plan. Nirmal, if that is the case, then you can do Pangong Tso as a day trip on 29th. +1 for you Yogesh Da. Please also provide some hotel details which are worthy to stay in winter trip. Thank you Vivek, as far as hotel recommendation is concerned, I had given that in Winter Travel FAQ, “Oriental Guest House (if it is open) and Shanti Guest House in Leh, both have central heating and Wi-Fi, though food is better at Oriental. Hot Spring Resort at Chumathang, no heating and for food you have to walk quite a bit, however it is built just above hot springs, so it stays comfortably warm throughout the night. Hi Vivek, wondering if you did go of for the Chadar trek with Rohit. We are planning to go in 2016 Jan and wanted some feedback. Let me know if I can get in touch with you and how. what are your trip dates with Rohit Khattar, I’m also doing the Chadar trek with Rohit on Jan 2016 from 14th to 24th. Winter in Ladakh would be a real something. Bookmark worthy post Mr. Sarkar. Thank you Anwesha, and yes, Ladakh in winter is even more beautiful and serene. You have got some excellent stuff on your site, appreciate the effort. I plan to visit Leh from 13th to 19th March’15, i seek your guidance in planning a suitable itinerary, covering the main attractions, also do you recommend pre booking a cab or would it be easily available there..i am not sure if pangong would be completely froze then.. Thanks for the help in anticipation !! Panmila, I am sorry about the late reply. 13th March: Arrive in Leh and rest, visit Shanti Stupa or Leh Palace, if feeling fine later in the day. 15th March: Leh to Nubra Valley, stay at Hunder. Visit Sumur, Panamik, Diskit and Hunder. 16th March: Back to Leh. 17th March: Day trip to Pangong Tso. 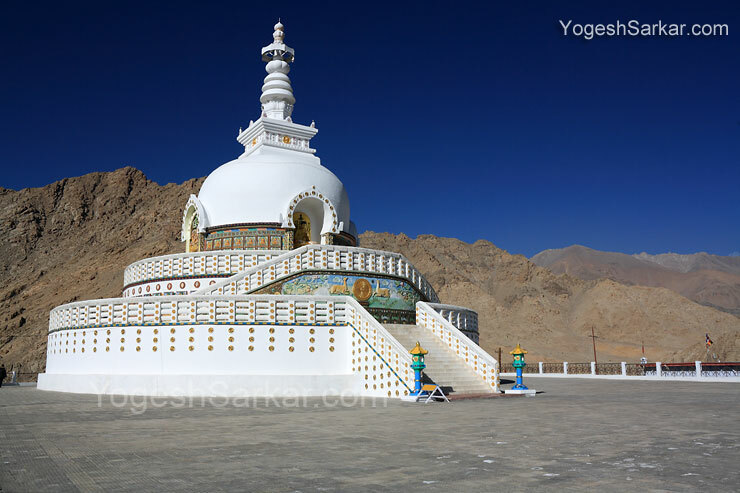 In case you aren’t interested in Nubra Valley, you can either skip it or do Pangong Tso and Tso Moriri or you can do Nubra Valley as a day trip and spend the night at Tangste, in order to spend more time around Pangong Tso. However accommodation at Tangste isn’t as good as what you will find in Nubra. You can easily find taxis after arriving in Leh, however my recommendation would be to hire Rigzin (+919622954779 and +919469472772) or Dorjey (+919906971501), both are excellent drivers and I along with several of my friends have hired the numerous time.